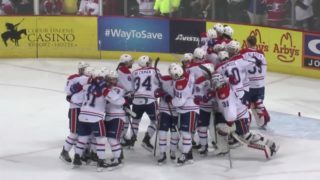 EVERETT, Wash. — The Spokane Chiefs took down the Everett Silvertips 3-1 on Sunday afternoon in Everett, taking a 2-0 lead in the best-of-seven second round series. Games 3, 4 and 5 (if necessary) are scheduled to be played at Spokane Arena this week. After a stalemate first half of the opening period, it was Everett who broke through first as Philadelphia Flyers prospect Wyatte Wylie fired a slapshot past a screened Bailey Brkin to make it 1-0 at 16:01. 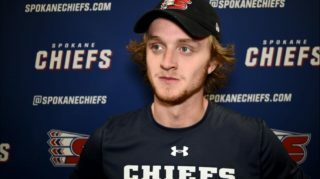 The goal was effectively a power play as Spokane’s Jake McGrew was just released back after taking a cross-checking penalty minutes prior. McGrew exacted revenge just two minutes later, chipping a puck past Everett defenseman Sahvan Khaira and dragging it through another defender before chipping a backhand shot past Dustin Wolf to tie the game at 1-1. 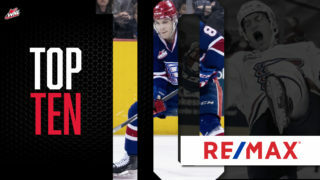 The highlight reel goal – the San Jose Shark prospect’s first of the playoffs – was assisted by Riley Woods, who extended his point streak to eight games (including regular season). Late in the second, forward Eli Zummack capitalized on the Chiefs’ second power play chance of the game, patiently waiting for an opening on the left side before roofing the puck above Wolf’s blocker for what would prove to be the game-winning goal. Co-captains Jaret Anderson-Dolan and Ty Smith earned assists. Imagine being the water bottle here, waiting anxiously only to narrowly avoid complete annihilation. 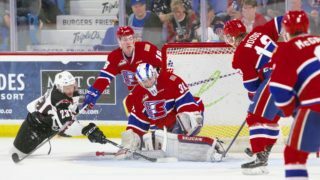 Spokane played a shutdown third period, utilizing short shifts and strong goaltending from Brkin to hold Everett at bay before forward Luc Smith scored the empty-netter for the second-consecutive game to seal the win with 32 seconds remaining. The Chiefs finished the game 1-for-2 on the power play and 3-for-3 on the penalty kill. 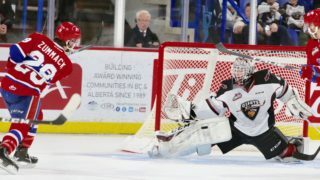 Brkin turned aside 30 shots while Wolf made 14 saves as Spokane was outshot 31-17. 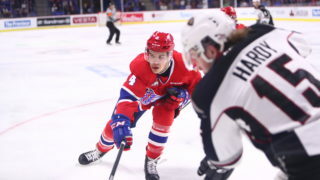 Spokane is now 4-0 on the road during the 2019 WHL Playoffs, winning twice in Portland in the first round before their two wins in Everett over the weekend. The series will return to Spokane Arena for Game 3 on Wednesday, April 10. Game 4 will be on Friday, April 12 while Game 5, if necessary, will be on Saturday, April 13. All remaining games in the series will begin at 7:05 p.m.
Tickets for Game 3 and Game 4 are available online, over the phone at 509-535-PUCK or in-person at the Chiefs’ Ticket Office at Spokane Arena.